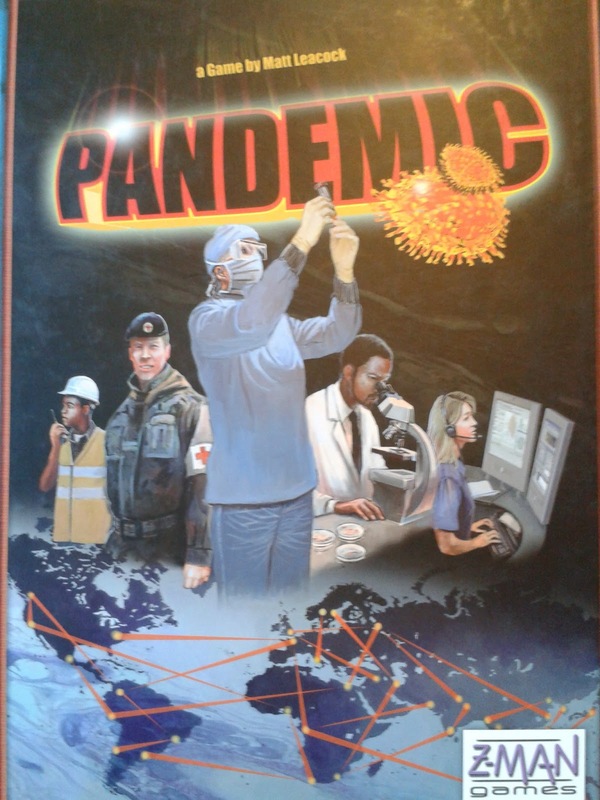 This week Games & Tea are going to be looking at Z-Man Games' Pandemic, ﻿a co-operative board game for 2-4 players. In you must work together to find the cures for four deadly diseases which have broken out worldwide, the game ending when either all diseases are cured or the human race is lost! 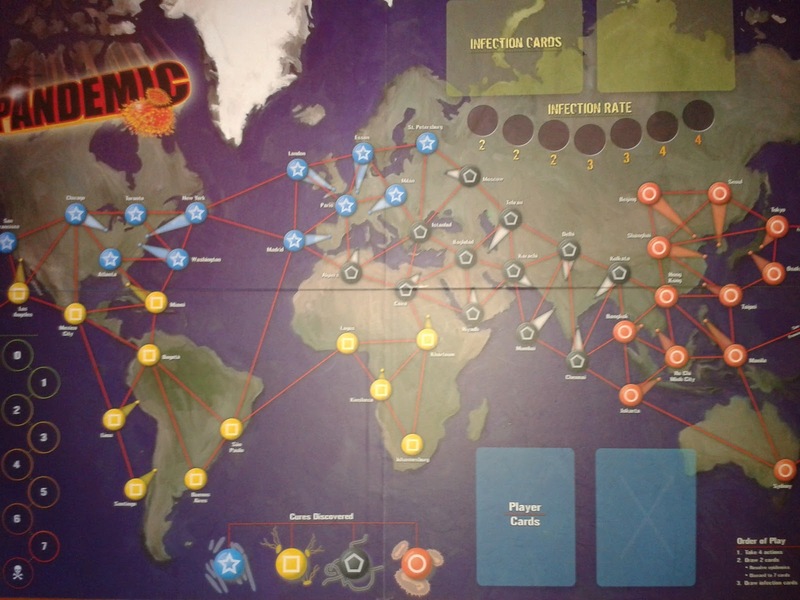 Pandemic was released in 2008, and since then a newer 2013 edition has been released, featuring new box art and extra character types. In our review we'll be looking at the 2008 original. 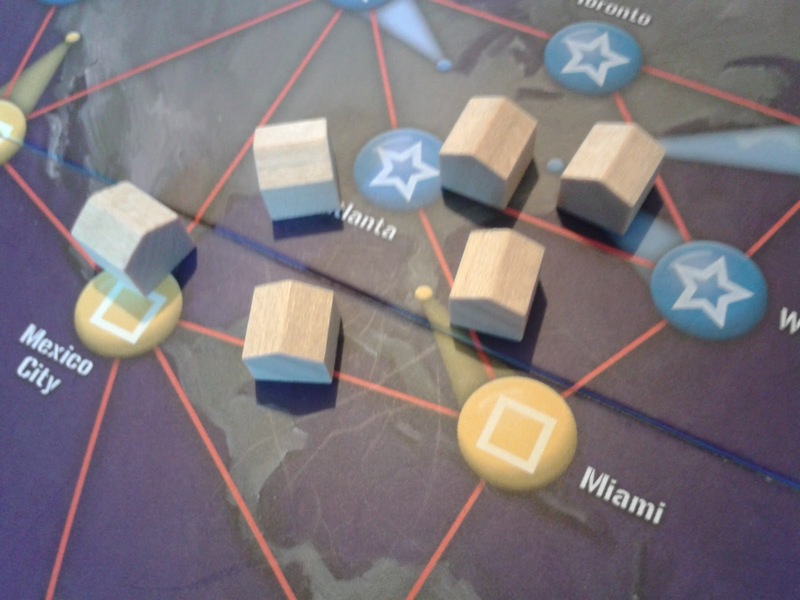 We established in our previous post that part 1 of any board game review would cover the contents of the box and what those pieces represent, so let's take a look at what you'll find when you open up your copy of Pandemic. The Pandemic board is a map of the world, with 48 major cities highlighted. The cities are split into four different colours to represent the four diseases. At the top of the board are the Infection Draw/Discard Piles and the Infection Rate Track - these dictate the spread and severity of the outbreaks throughout the game. In the bottom-left corner is the Outbreak Indicator, which keeps track of how well the players are keeping these diseases under control. In the centre of the lower board you'll find the Cures Discovered Area, which shows which diseases have been cured, eradicated, or not yet dealt with. To the right of here you'll find the Player Draw/Discard Pile, from which the players take cards at the end of their turns. In the very lower-right corner you'll find an Order Of Play summary, just in case you ever need a reminder of the turn order. The 48 cities are connected by red lines. These lines are the paths the players may take to move from one city to the next, but when a disease reaches it's maximum level in any city these red lines are also the paths upon which they move on to infect other cities. 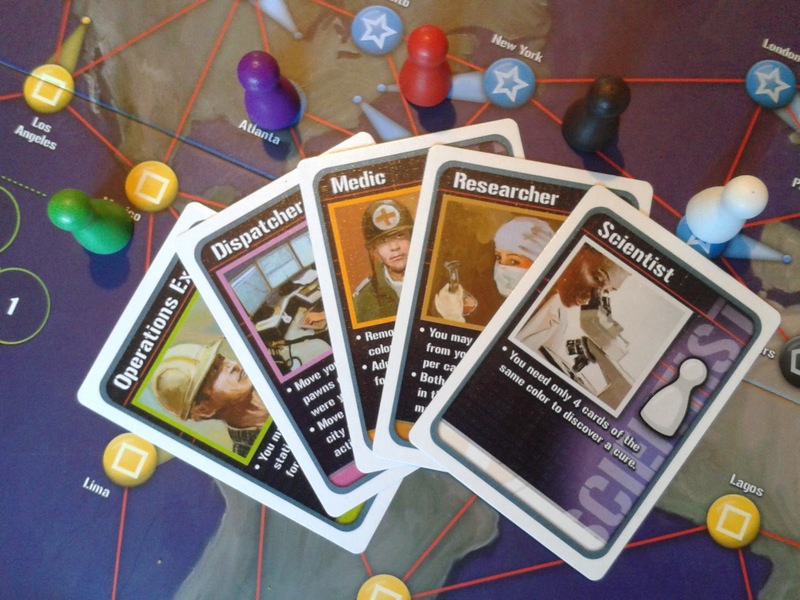 Whilst Pandemic is for 2-4 players, there are 5 different characters, and these are assigned randomly at the beginning of the game. The extra character allows a certain random element, so that 4 player games aren't always the same. The characters in the game are the Operations Expert, the Dispatcher, the Medic, the Researcher, and the Scientist, and each is represented by a wooden pawn in the colour of their card. During each turn in Pandemic the players have a selection of actions they may take, and each character has their own special abilities which must be used effectively if your team is going to succeed in their mission. 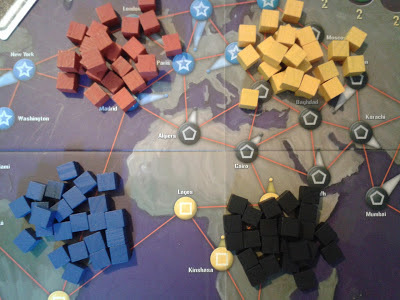 The four diseases in the game are simply represented by small wooden cubes of the appropriate colour. There are 24 of each, and when a disease hits a city 1-3 blocks will be places on that city's space. In order to cure the diseases the players must get their characters to a Research Station. These are represented by 6 Monopoly-style wooden buildings, and can be placed in any city around the world in the right circumstances. As well as providing a cure location, these can also be used as fast-travel points, to help the characters hop across the globe more effectively. 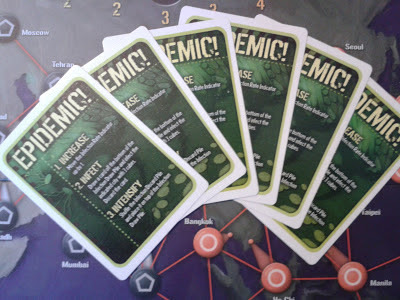 The Infection Cards determine the spread of the diseases. This deck consists of 48 cards, so there is one card for each city, and every time the top card(s) are revealed from the deck, those cities gain an extra Disease Cube of their appropriate colour. ...the Epidemic Cards. 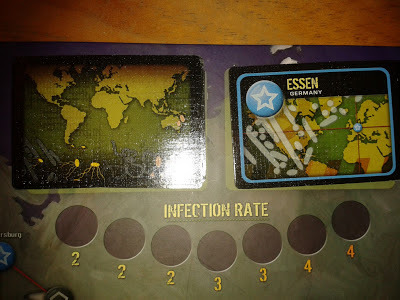 Whenever an Epidemic Card is revealed from the Player Deck the Infection Rate increases, a random city is infected, and the discarded Infection Cards are placed back on top of the Infection Deck. 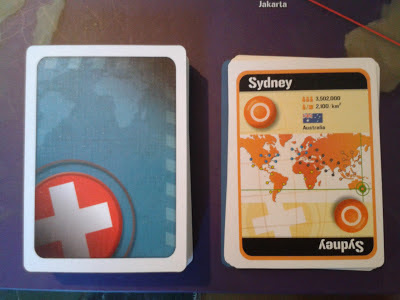 This means that the same cities are constantly being infected, and the game can quickly spiral out of control once an Epidemic Card rears its ugly head. There are 6 Epidemic Cards in the box, and the players can choose to begin with 4-6 of them in the Player Deck, depending on the challenge they wish to set for themselves. Now we've seen the contents of Pandemic, it's time to see how the game plays and to give it the all-important Games & Tea final score! Come back for Part 2 to find out what we thought!